I visited the Motografix motorcycle tank pad booth at the recent motorcycle Dealer Expo this spring in Indianapolis. 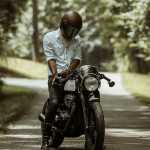 The Dealer Expo is the single largest show for U.S. motorcycle dealers to see new products, clothing and accessories and to place their orders for the big spring rush. 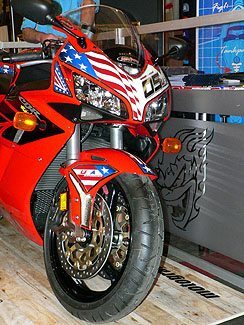 Motografix specializes in motorcycle tank pads and other types of motorcycle graphics. These are not your ordinary motorcycle tank pad – the Motografix products have a sort of “3D” effect. They’re made from a high-quality vinyl and they have a 3D gel layer, which also makes them ultraviolet (UV) stable, so they won’t fade. The resin is transparent, which really sets off the colors and the design. Motografix claims that the vinyl is “self healing”, and will not show scratches. The adhesive also is designed to go right to the edges of the appliqué, preventing the edges from curling. All of their products carry a lifetime guarantee. Motografix was founded in England in 1997. Mark Jarvis is the Director and Senior Designer at Motografix, and one look through their catalog is all it takes to see that Mark is a gifted and talented artist. 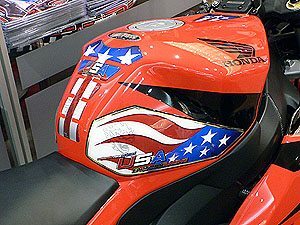 Motografix has some very cool designs for their tank pads, helmet stickers and badges and other products. Motorcycle clubs take note: Motografix can design small lot quantities with your logo. With a minimum order of 20 pieces (same) from the catalogue, they will add your logo free of charge. They also have some nice 3D badges and key chains, which can also be ordered with your logo with a minimum quantity is just 100 pieces. The photographs don’t do justice to these tank pads and other designs. They are very high quality and the graphics and colors are really nice. Here’s a 550×415 pixel photo of the tank pad. Motografix products are available worldwide through Motografix in the UK.